Just a short post and a tease of things to come. 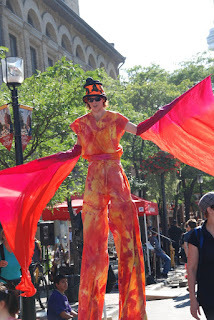 This Thursday Collette and I attended the annual Buskerfest here in town. 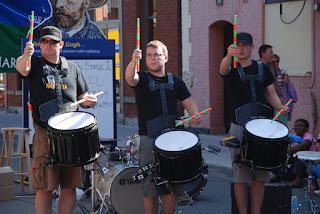 (Get the idea that Toronto is a city of street fests? Wait until the snow starts flying, then no life will be seen on these streets) It is staged around St. Lawrence Market, and features dozens of street performers from all over the world ... interesting how many of them are from Montreal, even if their country of orgin was someplace else. Toronto is still seen, I think, as a kind of dowdy matron whereas Montreal is a bit more New York City-like in its acceptance of artists. So there were stilt walkers and jugglers and ribbon dancers .... oh my! Of course, there was a patio and there was beer but what event would I attend that did not include those essential elements? But there was also the Pogo Dudes, three young skate boardy type guys who did some amazing tricks on these amped up pogo sticks. Extreme pogo-ing. Really, why does everything have to be extreme? 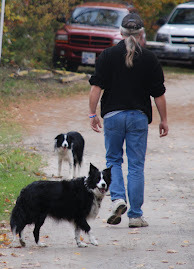 I saw a documentary on a guy who did what he called "extreme running" which basically entailed him tearing through the bush at break neck speed, smashing through branches, bouncing off of rocks and looking like there was a crazed posse on his tail .... 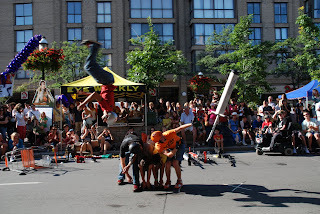 But back to Buskerfest . . . Besides these amazing flying pogo dudes we found us a musical Squid; a drum core/piping outfit that we have seen in the past. Again, this is like extreme drum corps/celtic music; a high energy outfit with a sense of humour and some really amazing precision drumming. As I said, this is just a kind of teaser post. Collette shot hundreds of pics with her Nikon and I shot close to two hours of raw footage with the XL1 ... so we both have some editing to do. In the meantime I did slam together this little video trailer, with just some of the highlights of the day. Toronto Buskerfest 08 Highlights from Victor Kellar on Vimeo.